3 days/0 nights. The Dakhla Weekend package combines three Dakhla classics (Dakhla like a local, Imlili and White Dune & Atlantic waves) to let you make the most of your short holiday in the Atlantic Sahara. Staying longer? Why not add a 2day/1 night desert tour across dunes and canyons, as well? Day 1. 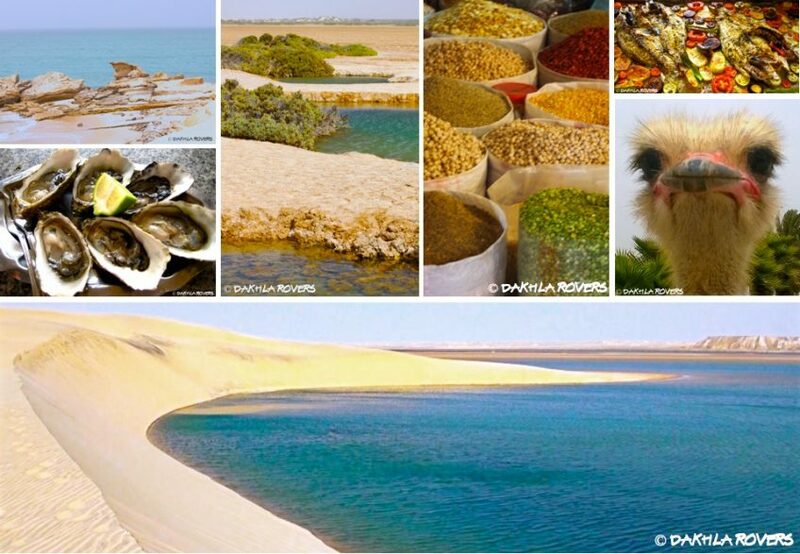 Discover Dakhla like a local visiting its market, its museum, its gardens, its local small businesses and some great places to eat and chill out. The perfect introduction to the local area and culture. Day 2. A Dakhla must! Reach the top of the White Dune and watch the entire bay unfold in front of you, look for flamingos and dolphins, enjoy your lunch at the Oyster Farm. We’ll end our day admiring the power of ocean waves on the western side of the peninsula. Day 3. Imlili is one of Dakhla’s classics. This excursion will bring you to a unique desert habitat in the morning, and let you enjoy a relaxing afternoon at secret beaches on the Atlantic coast. Imlili is characterised by permanent pools of salt water with small fish* recently identified as a new species. The area is surrounded by bush and plants, close to wells and a regular venue for wildlife and herders. Lunch included. Each full-day excursion begins at your hotel in Dakhla, in the morning, and ends at your hotel in the afternoon. Lunches on Day 1 and Day 2 are not included in the offer. Lunch on Day 3 is included and consists of a light meal (picnic style). Price: 340 Euro for a group up to 4 pax. Prices for desert and coastal tours depend on several variables, including length of itinerary and number of guests. Our itineraries are fully customizable and suitable for individuals, pairs and small groups up to 4-6 people – ask us for your tailored trip! * IMPORTANT NOTE: The Sebkha of Imili is a unique and fragile ecosystem that shall be visited with respect and care – we will not allow our guests to throw bread or other types of food into the pools to “feed the fish”, nor to bath or have “fish pedicure” as sometimes advertised.